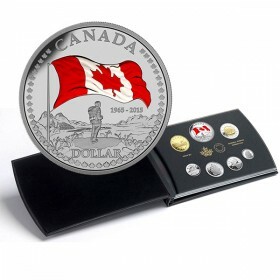 In late 1911, the Ottawa Branch of the Royal Mint struck a trial one dollar coin in lead; two more were struck in silver by the Royal Mint in London, England. 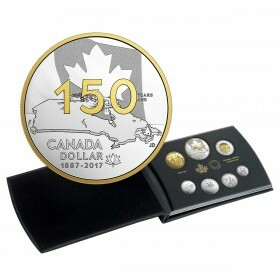 These three coins are among the rarest Canadian coins: the lead trial coin and one of the silver coins are now housed in the Currency Museum of the Bank of Canada in Ottawa, and the other is privately owned. The Currency Act of 1910 authorised the Ottawa Branch of the Royal Mint to strike one-dollar silver pieces, which it planned to do in 1911. 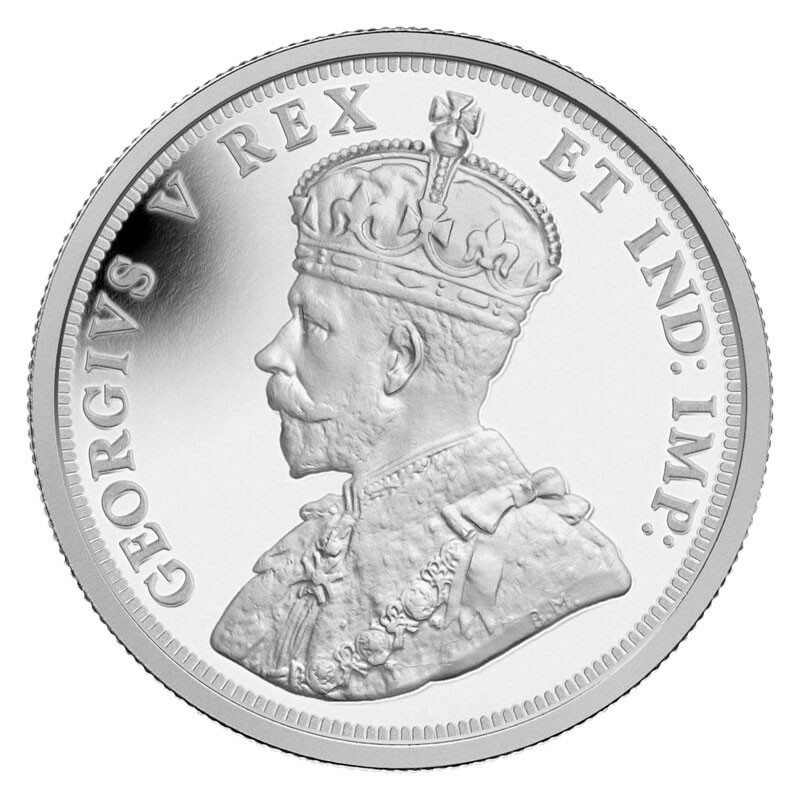 After King George V was crowned, a race ensued to ensure that his effigy would appear on coinage across the Empire, in time for the issuing of 1911 coinage. However, in May 1910, King Edward VII passed away, which sparked a fascinating sequence of events in the history of Canadian coinage. 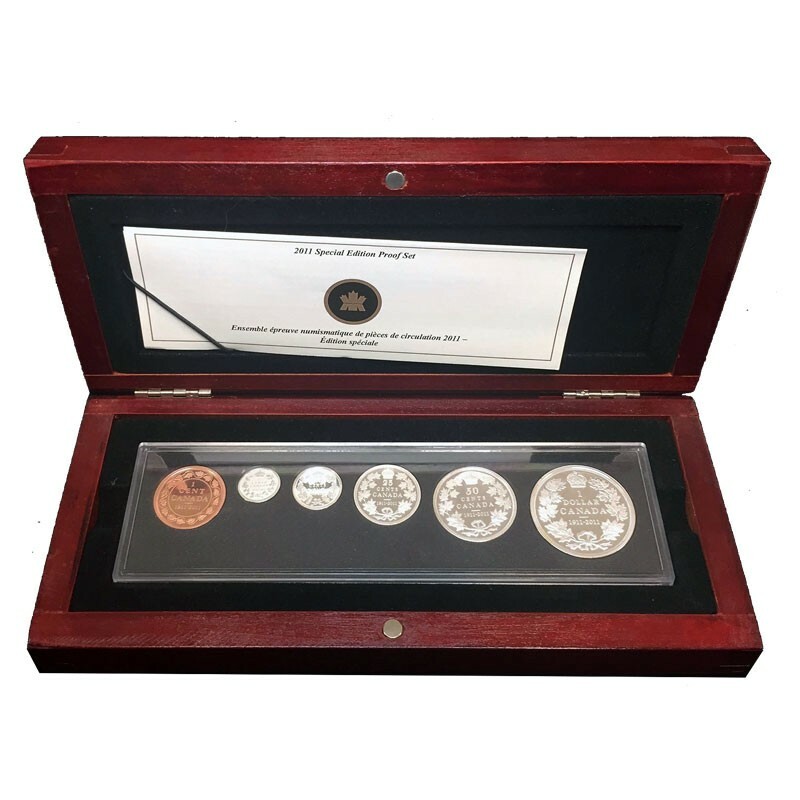 Since most of the master tooling had to be made at the Royal Mint in London and shipped to Britain’s Dominions and colonies, the engravers at the Royal Mint were under a great deal of pressure. As a result, creating the master tooling for the existing denominations-as opposed to the yet-to-be-introduced silver dollar-was made the priority, and the silver dollar was put on hold. 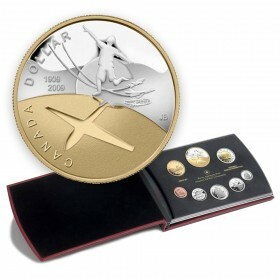 In early March, the Royal Mint requested that the Department of Finance choose one of two new obverses: one Latin, the other in English. Finance Minister William Fielding chose Latin, but failed to notice that the die lacked the 'Dei Gra[tia]' By the Grace of God -inscription. 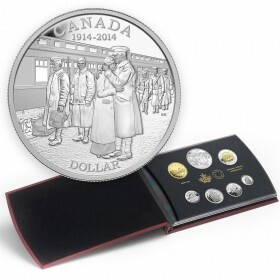 Midyear, the tooling arrived in Ottawa, where officials finally noticed the omission. 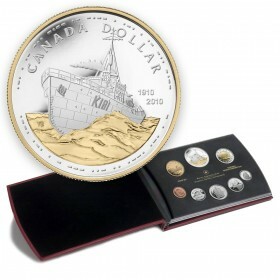 But, by then it was too late to request new tooling because reserves of 1910 coinage were running out; requiring the new 1911 coins lacking the correct inscription be put into circulation. This meant that in 1911 Canada had what came to be called 'Godless coinage'. 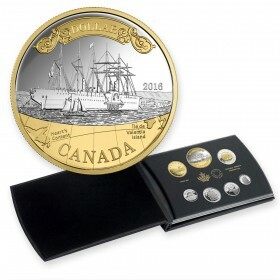 Finally, a change in government brought a change in policy and the Minister of Finance stated that the new government was shelving plans to create a Canadian silver dollar. 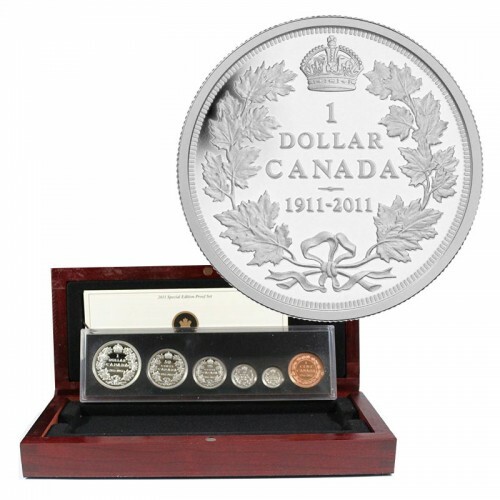 As a result of these exceptional events, the 1911 dollars became one of Canada’s rarest coins. - Special Edition coins: limited mintage! Only 6,000 Proof Sets. 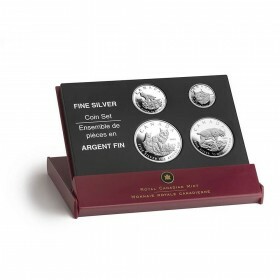 - Replica Set celebrates the 100th anniversary of the striking of the rare 1911 Silver Dollar, along with the other 5 denominations. The coins are double-dated (1911-2011). 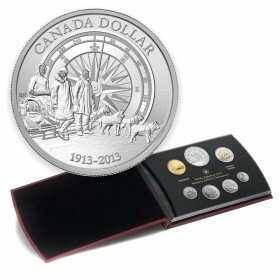 - The obverse of the Proof dollar features an exact replication of the original silver dollar as it appeared in 1911, marked by the inscription: GEORGIVS V DEI GRA: REX ET IND:IMP: Latin for 'By the Grace of God, King and Emperor of India'. 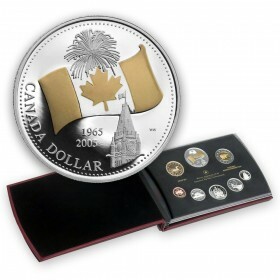 The other denominations did not include the 'DEI GRA' inscription and came to be known as Canada’s Godless Coinage. 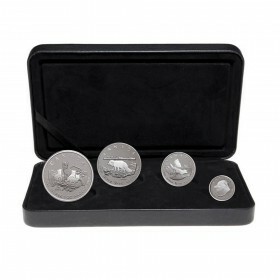 - The set features Replicas of the 6 denominations in their respective original sizes, including the larger size 1 cent coin, and smaller sized 5 cent coin. - In 2001, the Royal Canadian Mint issued a special 1911-2001 Commemorative Dollar with a similar design, but featuring Queen Elizabeth II on the obverse of the coin. 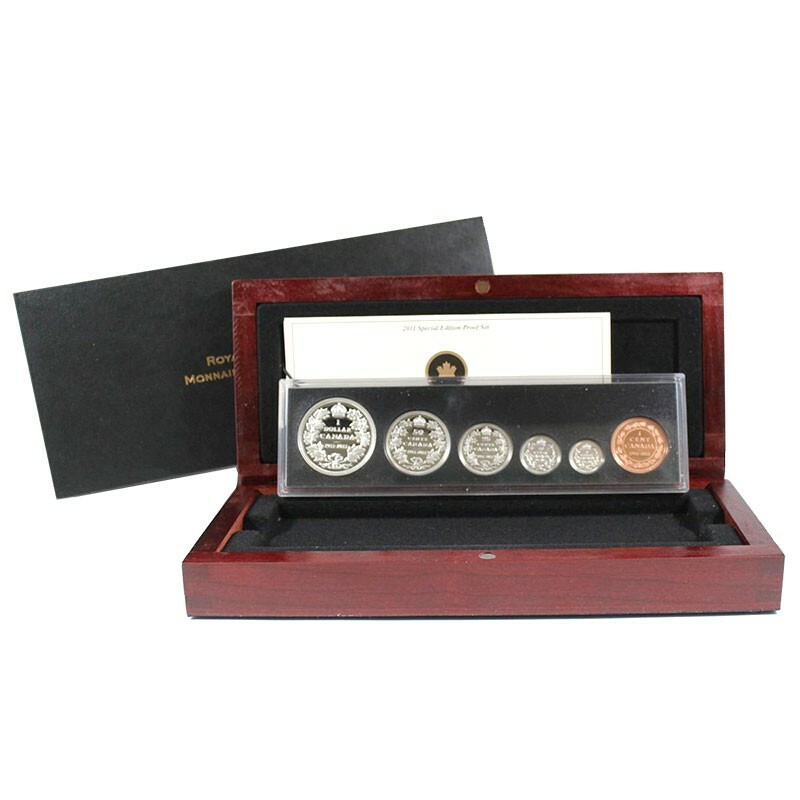 2011 (1911-) Canadian 6-Coin 100th Anniversary of the Silver Dollar Proof Set (Special Edition) comes encapsulated and presented in a long narrow, premium Cherry wood boxbox consistent with 1911 shape, black beauty box and Certificate of Authenticity. Artist: Royal Canadian Mint engravers adapted the 1911 coin designs.